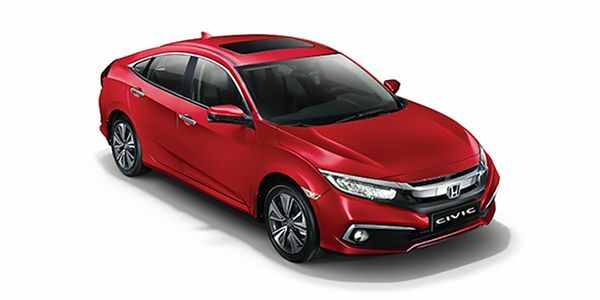 Honda has launched the Civic in India again at a starting price of Rs 17.7 lakh for the base V variant. The mid-spec VX variant has been priced at Rs 19.2 lakh for the petrol and Rs 20.5 lakh for the diesel, while the top-spec ZX variant costs Rs 21 lakh for the petrol and Rs 22.3 lakh for the diesel (all ex-showroom India). It is also being offered with a 3 year, unlimited km warranty, which can be extended to four or five year. The Civic rivals the Skoda Octavia, Toyota Corolla and the Hyundai Elantra. As of now, Honda has received over 1,100 bookings for the Civic. Honda dealerships are accepting bookings for a token amount of Rs 31,000. In its tenth generation, the Civic is being offered with a choice of a 1.8-litre petrol engine and a 1.6-litre diesel. The 1.8-litre, 4-cylinder, naturally aspirated petrol engine develops 141PS of maximum power and 174Nm of peak torque, paired to only a CVT. The 1.6-litre, 4-cylinder, turbocharged diesel engine, on the other hand, is good for 120PS of maximum power and 300Nm of peak torqueand comes mated to only a 6-speed manual transmission. In terms of features, the ZX variant comes loaded with goodieslike LED headlamps, electric sunroof, 17-inch alloy wheels, 7-inch all-digital instrument cluster, a 7-inch touchscreen infotainment system, 8-way power-adjustable driver seat, dual-zone climate control, engine remote start and lane watch function, which sends a feed from the left ORVM camera to the infotainment display. It even gets different view modes like top, normal and wide rear view from the rear camera. The Honda Civic comes to India with a 5-star ASEAN NCAP safety rating and gets anti-lock braking system (ABS) and electronic brake distribution, brake assist, automatic brake hold, vehicle stability assist with traction control, hill start assist (HSA), six airbags, and ISOFIX child seat mounts. Honda Civic prices start at Rs. 17.70 lakh for petrol and goes upto Rs. 21.00 lakh. The prices of Civic diesel variants start at Rs. 20.50 lakh and the top-end diesel is priced at Rs. 22.30 lakh. Honda Civic is available in 5 variants and 4 colours. The claimed ARAI mileage for the Honda Civic petrol is 16 kmpl, and for the Honda Civic diesel is 26 kmpl. Honda’s Civic makes a strong case not just for itself but for premium sedans in general. It’s hard not to get wowed by it! Q. Which engine is more powerful, Civic petrol or Civic diesel? Q. How is the performance of Jeep Compass? Is Compass better than Honda Civic? Q. Comparing Jeep Compass 4x4 and Honda Civic CVT ( same price bracket ), which is better option? My drive is mostly in city. Q. What is the difference between V, VXand ZX in both diesel and petrol variant? Q. Frank opinion about car. Honda’s iconic Civic sedan is back after a break. Does it still have the magic to make you stop thinking rationally? Honda’s Civic has grown up, quite literally. Compared to the eighth generation Civic we last saw, the new car is a whopping 111mm longer, and 49mm wider too. Now though, it looks sportier thanks to the hood that’s lower by 35mm, and the roof that’s now 17mm lower. Add the coupe-like roofline and the raised rear end to the mix and you’ve got a design that will make heads turn. Guaranteed. Adding bling to the svelte form are full-LED headlamps with daytime running lamps (lower variants will get projector headlamps), 17-inch machine-finished alloy wheels and ‘light pipes’ that extend on to the boot lid. Ground clearance has been adapted to suit Indian conditions, and an unofficial estimate puts it at around 170mm - which is plenty. Step inside...actually, you can’t. You’ll have to sit inside it, because the Civic retains its low seating position. This might not win favours with the oldie club, bear in mind. Space isn’t extraordinary in any manner, and feels just about enough. Also, the Civic is best used as a four-seater because of the central tunnel and the raised portion on the seat. Boot space, at 430 litres, is barely a cause for concern. On the features front, the top-spec Civic ZX is packing a whole lot. This includes dual-zone climate control, an electric sunroof, leather upholstery as well as electric adjust for the driver’s seat. It additionally features Honda’s LaneWatch tech, a 7-inch full LCD driver’s display and 7-inch touchscreen that supports Android Auto as well as Apple CarPlay. Talking about safety, the Civic has you covered there as well. The top-spec version gets tech like vehicle stability management, hill start assist and agile handling assist. Six airbags, ABS with EBD, ISOFIX child seat mounts and four disc brakes will be offered as standard across the range. Honda will offer the Civic with two engine options: a 1.8-litre petrol and a 1.6-litre diesel. The petrol engine is the same motor we’ve seen in the previous Civic, but is now tweaked to produce 141PS of power and 174Nm of torque. This engine can be had with a CVT, which robs some driving pleasure. But if you’re looking at the Civic as a companion for your everyday drives, you shouldn’t have a problem at all. The diesel engine has 120PS and 300Nm on tap, which seems a bit underwhelming. Again, inside the city there’s practically nothing you’d crib about. However, out on the highway you’d want some extra go-power. The Honda Civic is available in three variants - V, VX and ZX. The V is available only with the petrol engine and is priced at Rs 17.7 lakh. The mid-spec VX variant has been priced at Rs 19.2 lakh for the petrol and Rs 20.5 lakh for the diesel, while the top-spec ZX variant costs Rs 21 lakh for the petrol and Rs 22.3 lakh for the diesel (all ex-showroom India). Hyundai Elantra: The Elantra is a swanky sedan that doesn’t stray too far away from the Rs 20 lakh mark. It’s a healthy blend of sensibility, wow-factor and performance. The Elantra is the jack of all trades in the segment. Also, possibly, the master of none. It may neither be practical nor the most feature-loaded. But the design makes you swoon, the interiors feel special and built-to-last, and you've got the peace of mind associated with Honda's famed reliability too. Honda's Civic knows how to make you want it! The Civic will take on the Skoda Octavia, Hyundai Elantra and Toyota Corolla Altis. But can Honda price it competitively?